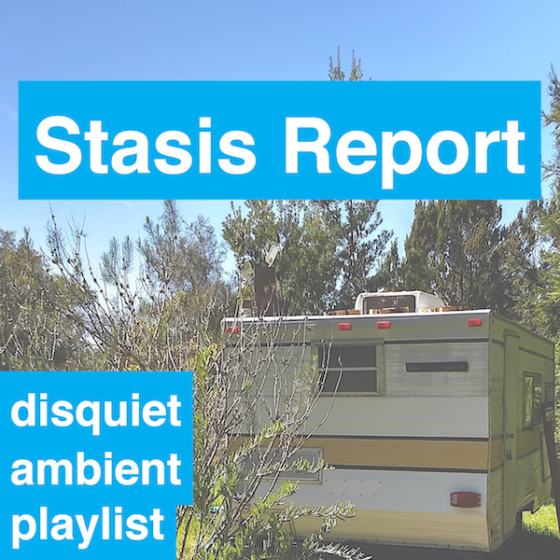 The latest update to my Stasis Report ambient-music playlist on Spotify, on Sunday, July 29, added the following six tracks. I’m really doing my best to keep this as restrained as possible. In recent years, the word “ambient” has come to mean very little in many contexts — in some cases it virtually just means “no voice,” or “quieter than regular pop music.” Sometimes it feels like a tag that someone has applied, whether lazily or cynically, out of a perception that it lends commercial or cultural viability. In any cast, this music in this ongoing playlist is intended as material that aspires to a state of stasis. Still, from the more overt melodic aspects of the Masayoshi Fujita track here to the harsher peaks of the Éliane Radigue, even that aspiration is being tested. ✚ “Occam River I” is the opening track of the album Occam Ocean Vol. 1, compositions by Éliane Radigue, featuring Rhodri Davies (harp), Carol Robinson (reeds), and Julia Eckhardt (viola): soundohm.com. Released last year on the Shiiin label. It was released last year. ✚ “Bass.int” and “Breath2” are both off the self-titled new album from Daniel Aged. ✚ “Clouds” is from Music for Nine Postcards, a 1982 album by Hiroshi Yoshimura reissued last year on Empire of Signs: empireofsigns.com. ✚ “Fog” is off Book of Life, the new album from Masayoshi Fujita on Erased Tapes: erasedtapes.com. ✚ “Rebreather” is from Semblance, the new record from Forma, on Kranky Records: brainwashed.com. The Montreal, Québec-based record label Moderna recently launched a weekly Single Series, all the tracks thus far are instrumentals that focus on piano. The series began on July 10th with “Sarah” from Jake Lowe, pleasantly reminiscent of old Windham Hill releases. Lowe, the track’s composer, plays midtempo piano, accompanied by a pair of strings: Charlotte Jacke’s cello and Ruby Paskas’ violin. The arrangement of “Sarah” is by Ross Irwin, who treats Lowe’s composition as a kind of classical-flavored pop song, with the strings filling the role of vocalist. A week later, on July 17th, came “Blocks” from Maxy Dutcher, performing solo on a combination of piano and unidentified synthesizer. It’s a blissfully upbeat track, the piano plucking along with a percussive quality, the minimalist melody unfolding like flower blooming. The synthesizer provides a swish of background haze, and only comes fully into view as the piano part fades toward the end. The most recent, out today, is “Gate” from Julia Gjertsen, who is only credited with piano on the track’s Bandcamp page, though the piece appears to, like Dutcher’s “Blocks,” combine piano with a synthesized accompaniment. 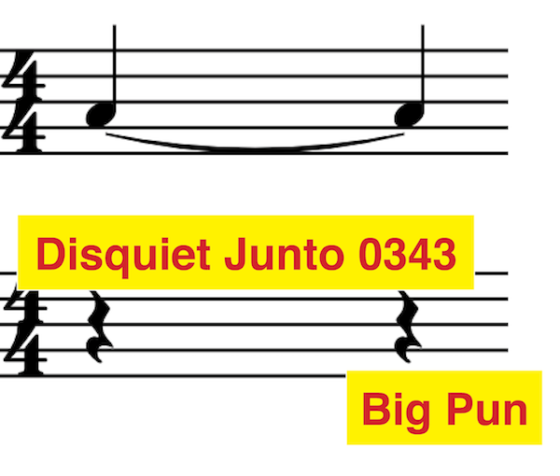 The piano, as with the previous entries in the Moderna series, is minimally melodic, and deviations from the main theme are tightly constrained. That restraint finds its match in the affectionately percolating rhythmic track that shares acoustic space with the piano. It’s a great series. Here’s looking forward to next Tuesday’s entry. More form Moderna at modernarecords.bandcamp.com and modernarecords.com. The latest update to my Stasis Report ambient-music playlist on Spotify, on Sunday, July 22, added the following five tracks. I seem to be adding work by around five artists each week, though the total number of tracks varies. This week introduces the third artist from whom an included track is titled “Interlude.” The previous two were Laraaji (as part of the debut Stasis Report playlist) and Julie Byrne. That seems to be a bit of a theme, the interlude often being the most peaceful moment amid a longer work, a moment marked both as transition and repose, or perhaps repose as transition. ✚ “Interlude” is from the 2017 album Ghosts Inside from Ekin Fil. She is based in Istanbul. ✚ “Evensong” is currently the only track on streaming services from Sarah Davachi‘s forthcoming album Gave in Rest, which is due out September 14th on the label Ba Da Bing. She lives in Los Angeles. ✚ “Ottomans” is off Everything Happens, for Some Reason, the 2018 album by Jet Jaguar, aka Michael Upton of Wellington, New Zealand. ✚ Rezzett‘s “Yunus in Ekstasi” is off its recent self-titled album, on the Trilogy Tapes label. Rezzett appears to be anonymous for the time being. It also appears to be a duo. The label is based in London. ✚ “Conclusio” is the final track, and the shortest, off the new album from Marta SmiLga (aka Liga Smirnova), Lunar Maria. She is based in Riga, Latvia. The Assignment: Record a piece of music in tribute to Terry Riley's In C using only samples of water sounds. Deadline: This project’s deadline is Monday, July 23, 2018, at 11:59pm (that is, just before midnight) wherever you are on. It was posted in the morning, California time, on Thursday, July 19, 2018. The Assignment: Record a piece of music in tribute to Terry Riley’s In C using only samples of water sounds. Step 1: You’ll be recording a piece of music in tribute to Terry Riley’s In C. (If you’re unfamiliar, read up and listen.) Don’t use the actual composition. Consider aspects of it, and choose ways to emulate them, to extrapolate compositional ideas from them. 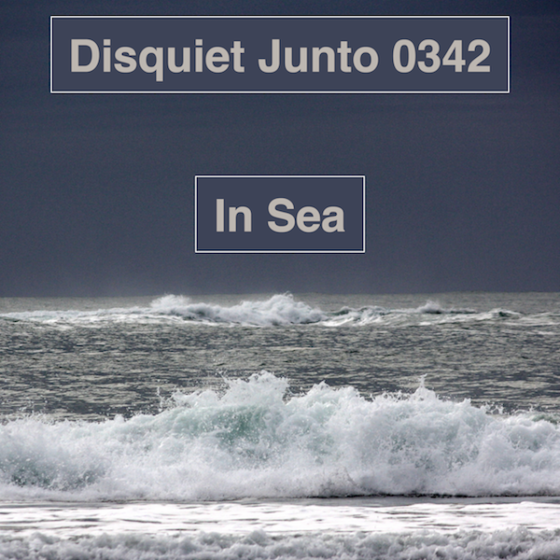 Step 1: Include “disquiet0342” (no spaces or quotation marks) in the name of your track. Step 2: If your audio-hosting platform allows for tags, be sure to also include the project tag “disquiet0342” (no spaces or quotation marks). If you’re posting on SoundCloud in particular, this is essential to subsequent location of tracks for the creation a project playlist. Title/Tag: When posting your track, please include “disquiet0342” in the title of the track, and where applicable (on SoundCloud, for example) as a tag.